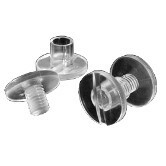 Like our black and white large head screw posts, these push-lock screws have a larger head. You can easily assemble them by pushing the post and screw together; threading is not required. Now available in a clear resin.